The Waikato District Council proposes to create a roundabout at the Newell Rd-Birchwood Lane intersection. A range of traffic calming measures are being planned for Newell Rd, including rehabilitation work around the Newell-Birchwood intersection, the Tamahere Community Committee (TCC) has heard. It would be advantageous to proceed with the Birchwood Lane roundabout at the same time as other work was being carried out on Newell Rd, WDC’s general manager roading and projects Ian Gooden told the committee’s August meeting. Gooden will make a formal report on the council’s Newell Rd plan to the committee at its September meeting. TCC has urged Tamahere residents to have a say on the future of Tamahere by making submissions on the Tamahere Structure Plan. . The plan, two years in the making, proposes the rezoning of some land for future retail and recreation activities in the Tamahere Country Living Zone – a village hub, updates walkways, and recommends amendments for stormwater and wastewater management along with some new provisions and design guidelines. The plan can be viewed here on the Waikato District Council website, where submissions forms can also be found. Submissions close on August 28. Meanwhile, the extension to Birchwood Lane toward Devine Rd has been completed. Civil Construction Services of Cambridge began building the 860m road in late February and it has been recently sealed. The lane does not continue through to Devine Rd and is unlikely to for many years. 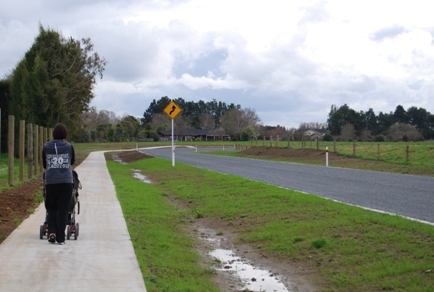 However a footpath along the sealed length of the road gives walkers more options along with the nearby Violet McKenzie walkway, which has proved very popular. TCC spokesman Leo Koppens said walkers could make their way along the unsealed section though it is very wet currently. A final grading of the unsealed surface was expected to be done in summer, which could make it suitable for cycling, he said. The new route was a welcome addition to the recreational walking options in Tamahere, Koppens said. TCC has endorsed the restoration of a little known Tamahere Reserve, on Tauwhare Rd, as one of its “most important long term environmental projects”. TCC and Tamahere Gully Care have prepared a proposal to the Waikato District Council for restoration of the 4.6ha reserve, which in its current state has been described as an “eyesore” and a dumping ground for rubbish. Experts have also advised tall, poorly maintained pine trees in the reserve could become a hazard to traffic on Tauwhare Rd hill at the State Highway 1 intersection end. In a report to go to WDC, Tamahere Gully Care’s Leo Koppens, also a TCC member, said despite an appearance of neglect, there were many regenerating native trees, shrubs, ferns and low growing plants in the lower reaches of the reserve, which borders the Mangaone Stream. There is scope for at least 400 metres of walkways and boardwalks through the reserve, whose restoration has a growing list of supporters, including Tamahere School which has long wanted a a conservation project nearby the school. The TCC-Gully Care report requests support from WDC in the form of a continuation of its grant for gully care in Tamahere, backing for applications to other funding providers, and assistance with roadside fences, gates and signage. It also asks the council to consider ending a lease to local trucking firm Regal Haulage for a portion of the reserve, which it uses for truck washing. The report is expected to go before the council’s water and facilities committee on September 4.